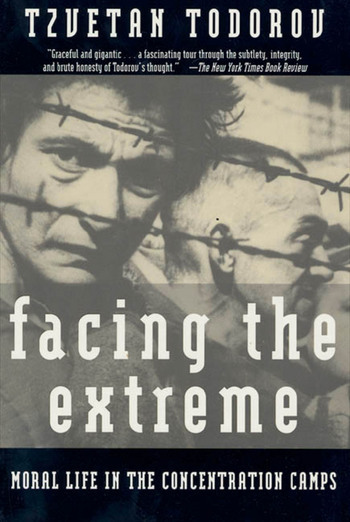 The Nazi concentration camps and the Soviet gulag provide the context for this acclaimed examination of the human capacity for moral life. Drawing on a striking array of documents, Tzvetan Todorov reconstructs a vivid portrait of the conduct of those who ran the camps and those who suffered their outrages. Challenging the widespread view that moral life was extinguished in the extreme circumstances of the camps, he uncovers instead a rich moral universe, composed not of grand acts of heroism but of ordinary gestures of dignity and care, compassion and solidarity. A complex and profound study, Facing the Extreme restores a lost dimension to this anguished history, even as it offers an eloquent plea for the recognition of everyday virtues as a basis for contemporary morality. Tzvetan Todorov is the director of research at the Centre National de Recherches in Paris and the author of many highly acclaimed works, including The Conquest of America.